I decided that since I just made salsa and guacamole, we should have shrimp fajitas tonight. Glad I have shrimp in the freezer and lucky me they are already deveined. I loath deveining shrimp. This is really an easy but impressive meal to make. All of my brood really like fajitas too. Raine even chowed down on the shrimp tonight. Well that is "what's cookin" tonight on Beaty's Creek. Place onions, peppers, and shrimp in a large bowl and mix seasoning packets with 1 cup of oil, I use canola, and 2 cups of water. Let marinade in the fridge for at least 4 hours or a little longer is fine. You will have to cook your fajitas in batches. Don't over crowd your pan. I use a caste iron fajita pan that is not real large so I must cook in smaller batches. I also use part of the marinade to cook my fajitas in. I really like the marinade with my fajitas but this is up to you. 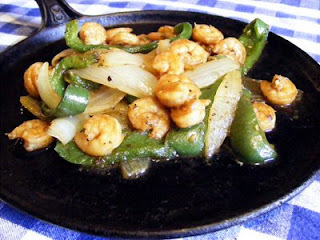 Cook your fajitas until the veggies are the tenderness you want and the shrimp is no longer transparent. This happens in about 10 minutes over medium high heat. Serve them with salsa, guacamole, cheese and sour cream. I need to make my own tortillas though. I think maybe that will be my new project, we will see.